"Highlander Shepherds was established in 1996 when we purchased our first Shiloh Shepherd. Highlander Shepherds is committed to stable temperaments, super intelligence and great size. We have both plush and smooth coat varieties, our breeding program is very selective and our litters are home raised. We are dedicated to the breed and to the people who are involved with it. My expertise is wide spread in the world of dogs in general and Shilohs specifically. We have previously been involved in many areas of the Shiloh world in the past and hope to continue that involvement now. I am qualified to do Litter Evaluations, certified to do Adult Temperament testing and have shown and champion pointed many of our Shilohs. I have produced at least 8 litters of quality Shiloh pups and take pride in having done so. 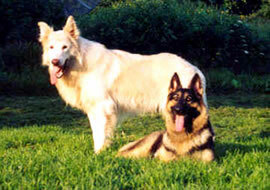 Remember, when chosing a Shiloh Shepherd, may that one be from Highlander Shepherds"